Posted January 11, 2015 - The Ford EcoBoost-powered Rileys of Chip Ganassi Racing with Felix Sabates have been posting competitive times during the Roar Before the 24 Tudor United SportsCar Championship test session at Daytona International Speedway this weekend. 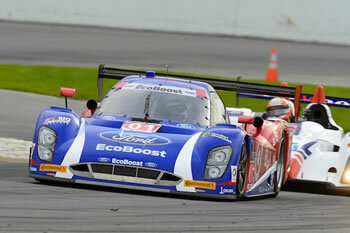 Two of the the team’s cars have been on the track and are scheduled to run in the upcoming Rolex 24 at DIS. Driving those cars will be some of the biggest stars in American racing. WHAT DOES IT FEEL LIKE TO GET BACK IN YOUR CAR AFTER A BREAK? DOES IT FEEL LIKE YOU’RE GOING TO YOUR SECOND HOME, OR LIKE THE FIRST DAY OF SCHOOL? “Second home. More than anything. Everybody looks forward to coming back here. You can’t wait until the end of the year, then you can’t wait for Daytona to come around. This kicks off everything. This kicks off all of motorsports. Everybody wants to be here. Every driver wants to be here. You see a bunch of guys coming over from Europe to be part of it. Everybody’s just excited to get here. SAGE KARAM: YOU’RE GETTING MORE TIME IN THE PROTOTYPE UNDER THE LIGHTS, WHICH IS SOMETHING YOU DIDN’T HAVE LAST YEAR OUTSIDE OF THE ROLEX 24. “I think everything’s a little bit better this year. We’re all a bit more prepared and we learned a lot from last year. I’m thinking we’ll see more consistency this year at the Rolex. I’m looking forward to it. Driving under the lights is completely different than driving in the day time, so it’s good to get 10-15 laps in tonight. We take all that data and we’ll learn from it tonight.